In case you have never seen it, Jeeps can scale sheer rock cliffs. 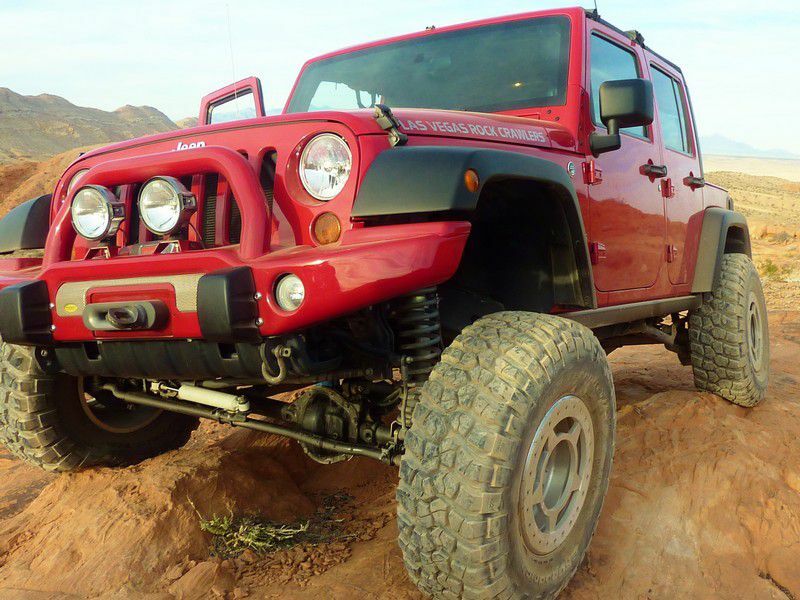 Las Vegas Rock Crawlers will make you feel like an off-road adventure veteran while allowing you to learn the little things that prevent accidents from happening while in an off-road vehicle. Las Vegas Rock Crawlers is an off road adventure run by people who understand customer service as a very personal experience. You’ll be guided through the trails and instructed on every aspect of the vehicle you will be driving. Driving adventures include rock crawling as well as gliding though sand dunes where you are behind the wheel or in the passenger seat. After a complete briefing on a trail, you will be walked through an ascent or a descent. (Literally walked though) Your guide will help you find the best lines as well as give you all the tools to necessary navigate the obstacles as well as guide you up, over and around the off road maze of boulders, gulleys and walls. Las Vegas Rock Crawlers will take you on tours in the Valley of Fire, on the Apex/Nellis Dunes and the Amaragosa Dunes as well as El Dorado Canyon and other trails. See their website for information on trails and availability. The prices vary per experience so it’s best to check their website for updated pricing. It is comparable to other activities found from the Las Vegas strip. Their prices include transportation from the strip and typically are longer than most excursions. You will get a lot for the money you pay and you will have a great time. Is Las Vegas Rock Crawlers Safe? Your guide will explain, describe and show you how to do everything to ensure that you have a safe and enjoyable off road ride. You will actually follow him or her through the obstacle and then as you drive they will be right there to help you through the experience.